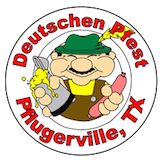 Come join the fun in running the Deutschen Pfest 5K during the 44th year of Pflugerville's Deutschen Pfest! This chip timed race will be run on Sunday, May 19, 2019 through the streets of beautiful Pflugerville, Texas. The chip timed 5K starts at 8 AM and the untimed Kid's K will start following it at 9 AM. Register early to take advantage of discounted pricing and also to guarantee your race T-shirt! Dogs and strollers are welcome at this race! For everyone's safety, please start at the back of the pack if you're running with a dog or a stroller. Please note that those persons registering after May 6 will NOT be guaranteed a race T-shirt. Form your own team of 4 or more! Invite your family and friends to register on your team and each person will receive a $3 discount on their race entry. Children 8 and younger can join in the fun by running in the Deutschen Pfest Kid's K during the 44th year of Pflugerville's Deutschen Pfest! The untimed Kid's K will start at 9 AM, following the completion of the 5K. Register early to guarantee your race T-shirt!